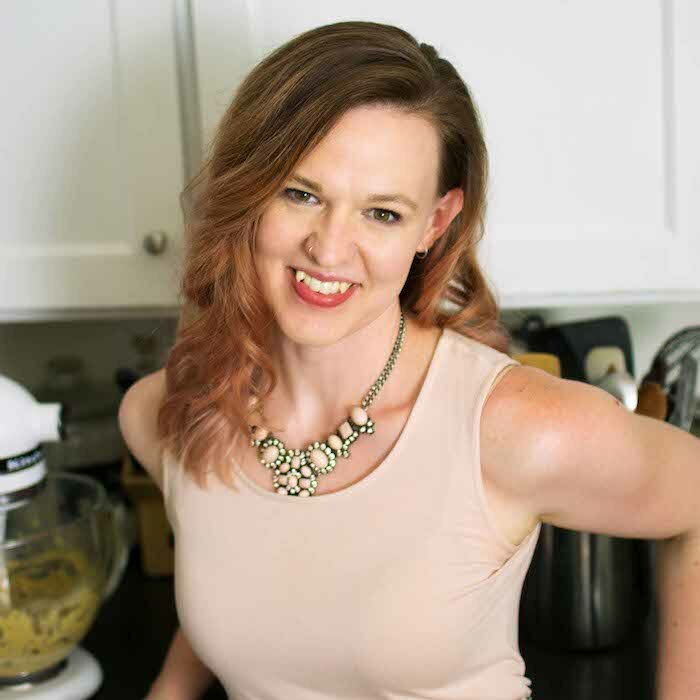 Bridget over at Bake at 350 does this thing every June called “Dessert for Dudes.” It’s sort of in honor of Father’s Day, but she does it all month. I thought it was a cool idea, so I asked Hubs what his favorite dessert was. He doesn’t have one favorite, but he listed off several that he really likes. One of the top ones was carrot cake. 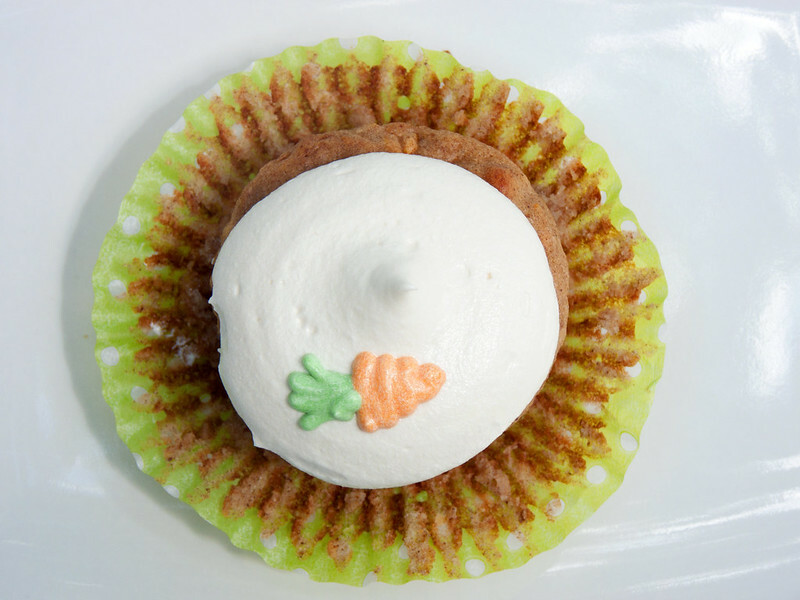 When I thought about it, I couldn’t remember ever having made a carrot cake before. My friend Emma made a raw carrot cake for her daughter Olive’s first birthday, which had no sugar. I tasted a bit of it and it was delicious. 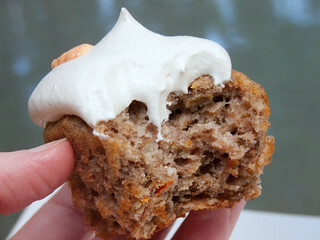 So I decided to try my hand at naturally sweetened carrot cake. I’d heard of people using dates in place of sugar, so I Googled it. I found this recipe. I used my immersion blender to blend the dates & soaking water and it worked great. For this recipe you’ll need 3/4 cup. 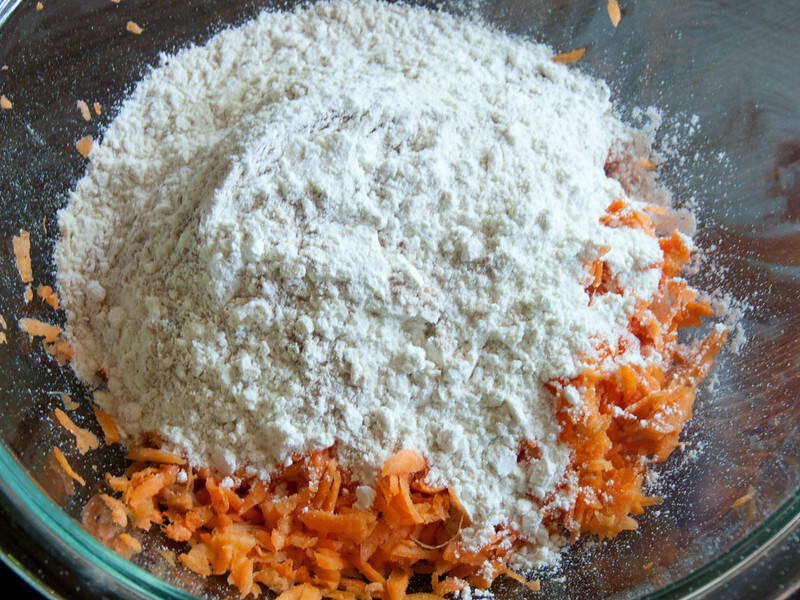 Since I hadn’t made carrot cake before, I needed a recipe to work off of. I used Alton Brown’s recipe because Alton’s never steered me wrong. 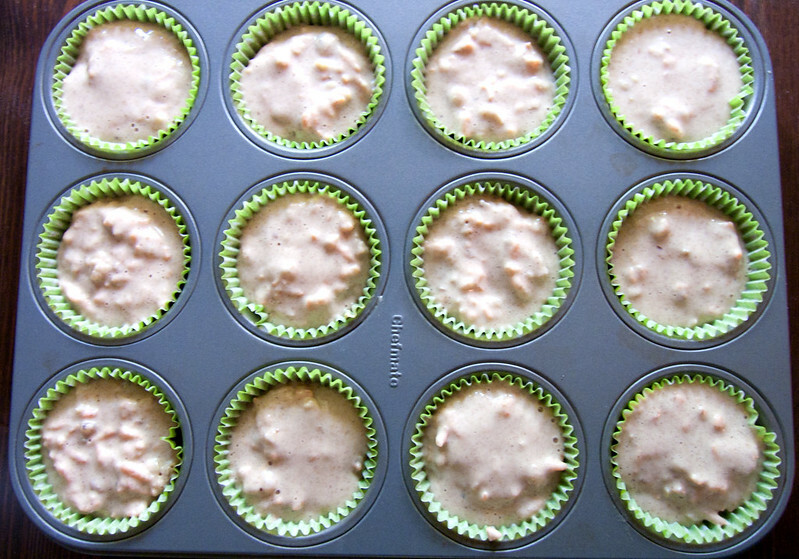 But I modified it fairly significantly to make it naturally sweetened and the right amount for 12 cupcakes. First you’ll need grated carrots. You’ll need about 3 medium carrots. My carrots were small so I used 5. 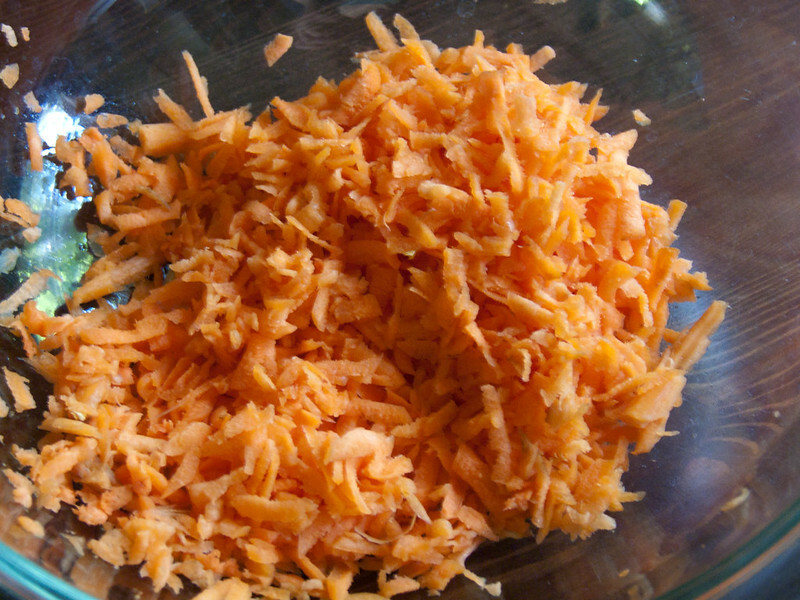 If you have a kitchen scale, you’ll need 6 oz of carrots. I think next time I’ll use a finer grate for my carrots. This worked fine, but it was a little chunkier than I like. 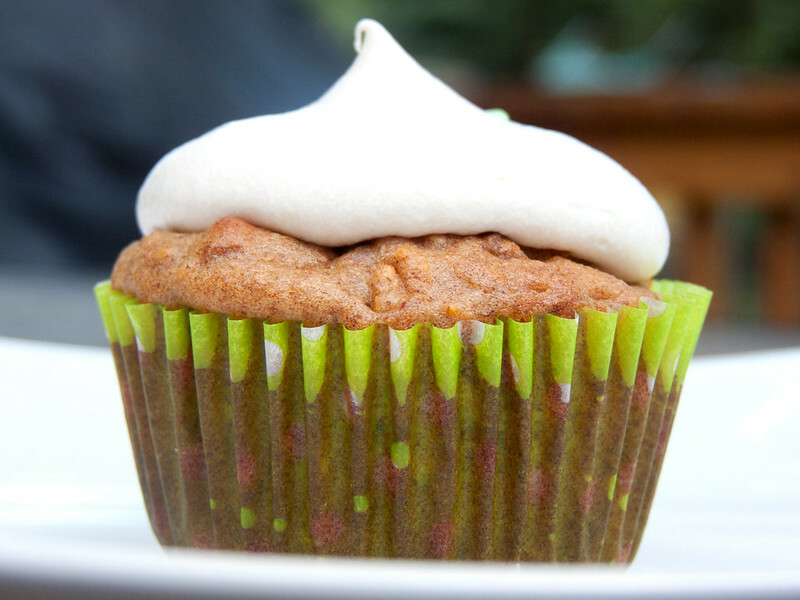 In a food processor, blend up 1 1/4 cups all-purpose flour, 1/2 teaspoon each baking soda and baking powder, 1/4 tsp. salt, 1/2 tsp. cinnamon, and about 1/8 tsp. 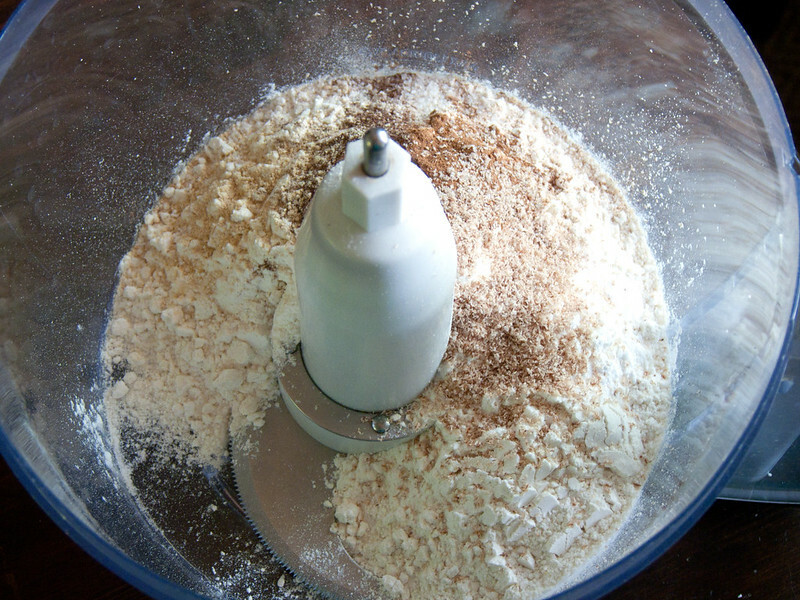 each of ground allspice, ginger, and freshly grated nutmeg. I think next time I’ll up these spice measurements a tad because I like the stronger spice taste. Cuz I’m spicy like that. 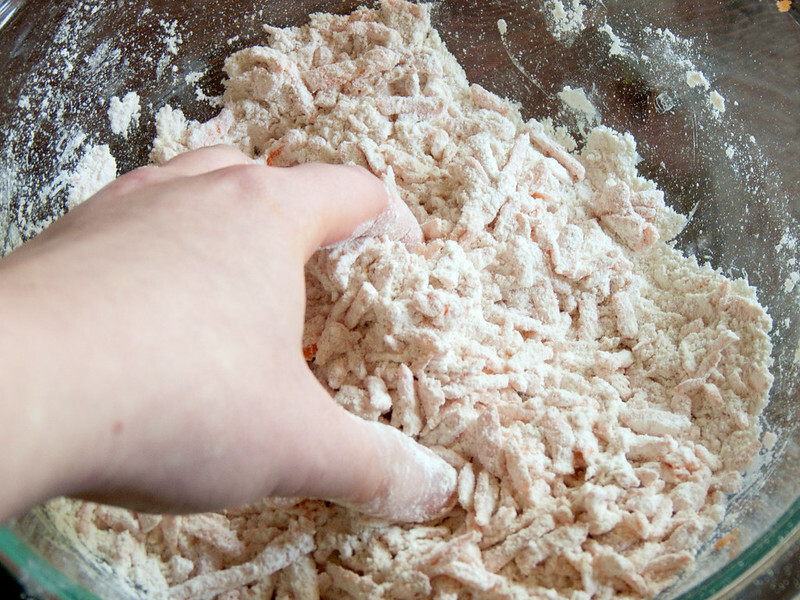 and mix it up with your hands. 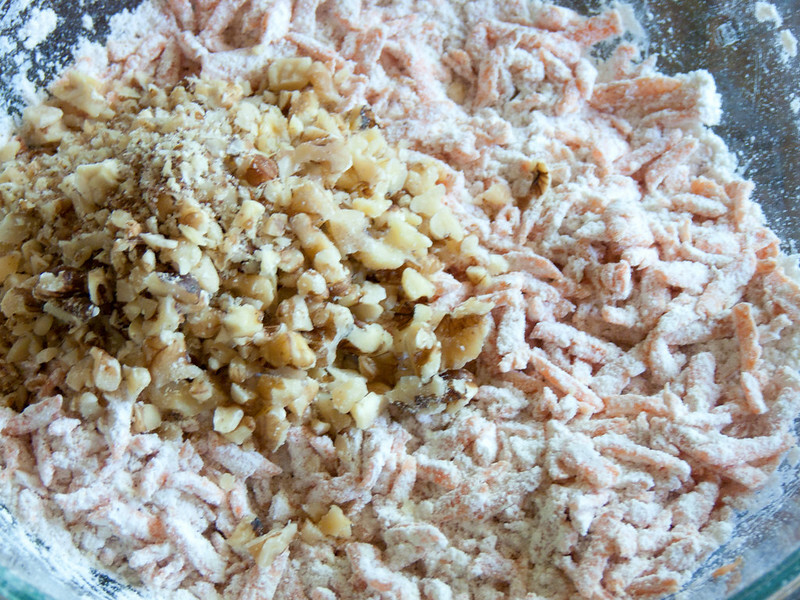 Also add to this 1/2 cup chopped walnuts and mix again. 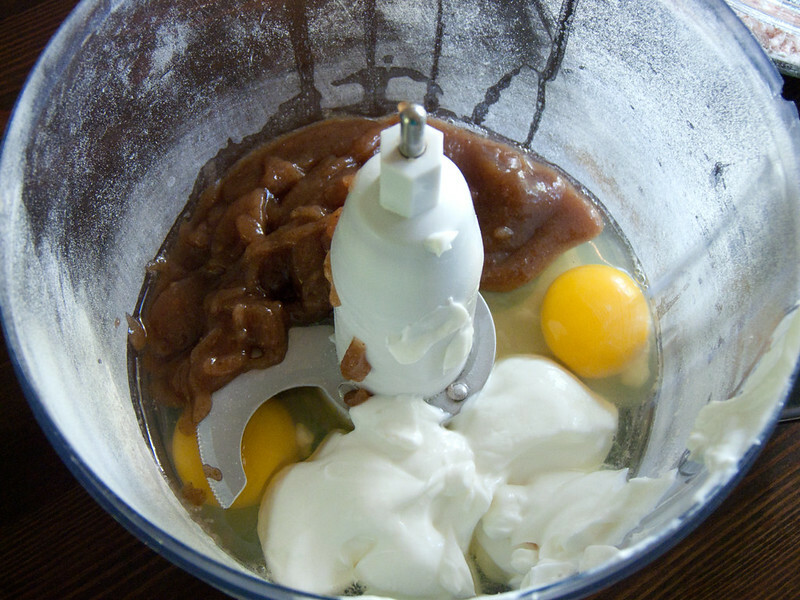 In the bowl of your food processor, mix together 3/4 cup of the pureed dates, 2 eggs, and 6 Tbsp. plain yogurt. I used Greek because it’s what I had on hand, but you can use regular, too. 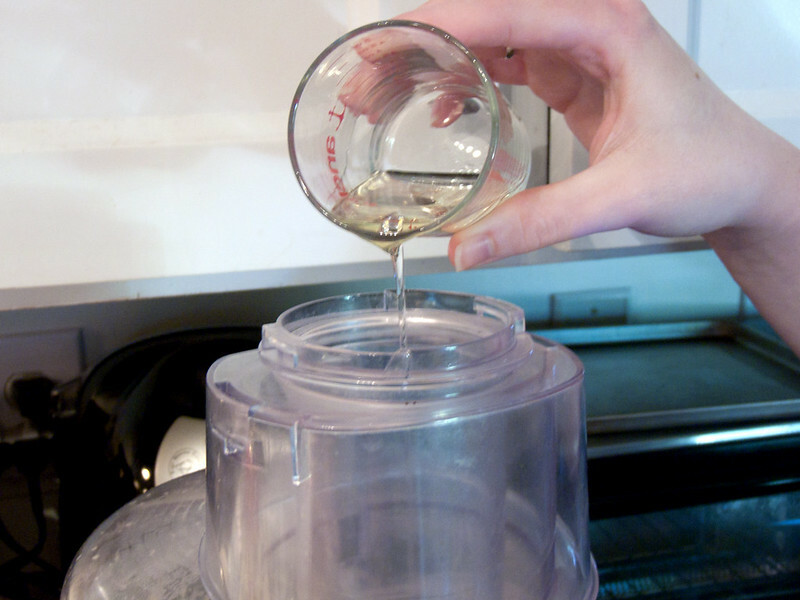 While the food processor is running, drizzle in 1/4 cup vegetable oil. That’s my sister’s lovely hand. 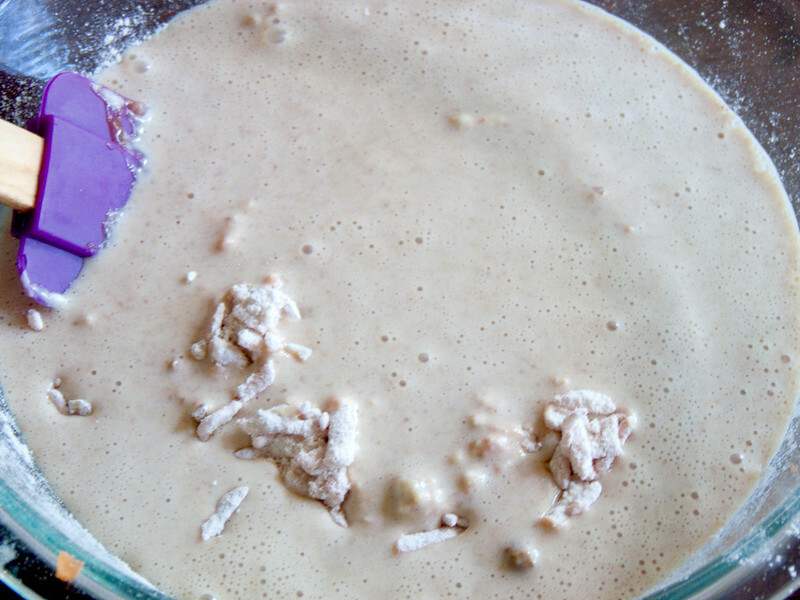 When blended, add it to the flour mixture and fold in gently until just incorporated. 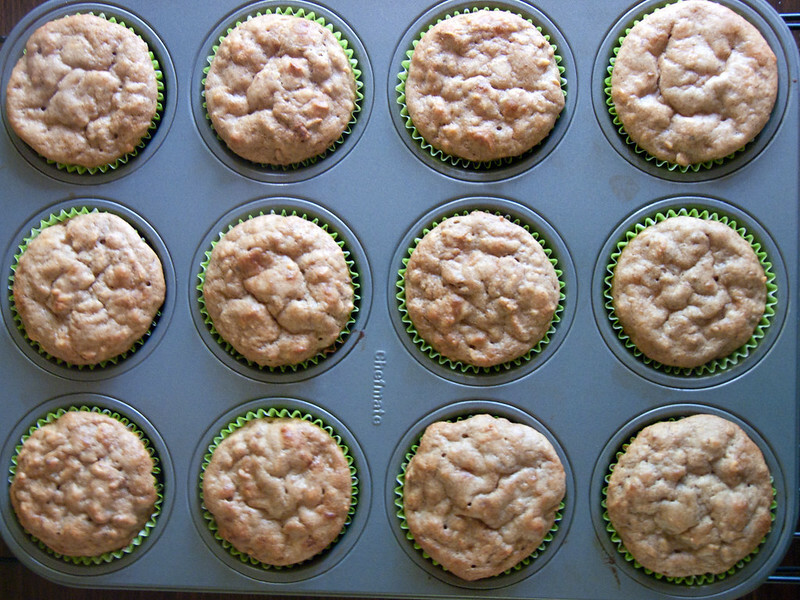 Divide the batter among 12 muffin cups lined with a paper liner, or (alternately) greased & floured. Bake at 350˚for 20-25 minutes or until golden around the edges. Lovely! If you wanted some delicious and healthy carrot muffins, you could leave these like this. But we’re making carrot cake and so we have to add some calories. 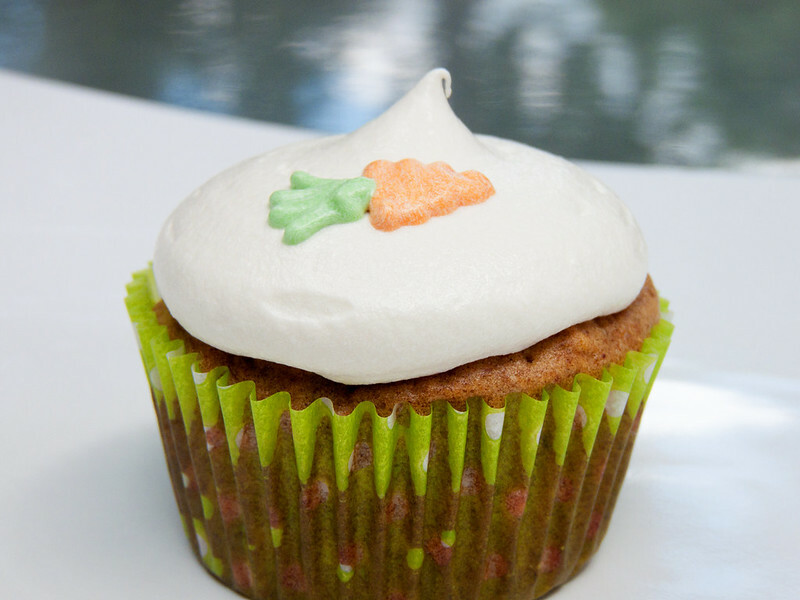 And what’s carrot cake without cream cheese frosting?? For this, I took the recipe straight from Emma. Lucky for me, she had posted it on her blog. 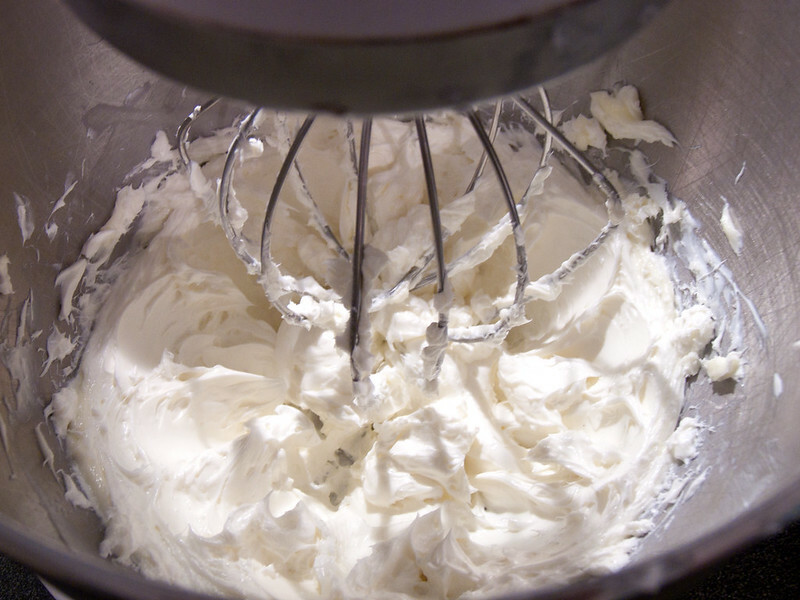 Put 1 8-oz package softened cream cheese and 1/4 cup softened butter in an electric mixer fitted with the whisk attachment. Beat together. Add to this 1/4 cup pure maple syrup. Don’t use the fake stuff. I figured that since the cake was naturally sweetened, it would be kind of counter-productive to use powdered sugar. If you’re afraid of the maple flavor here, don’t be. The cream cheese flavor is by far the most dominant in the frosting. What I was a little nervous about was the consistency. Powdered sugar works not only as a sweetener, but a stiffener as well. I wanted this frosting to be pipe-able and not at all drippy. So I beat the dickens out of it. I beat it for about 10 minutes, to incorporate as much air into it as possible. See, I even got a nice stiff peak out of it! 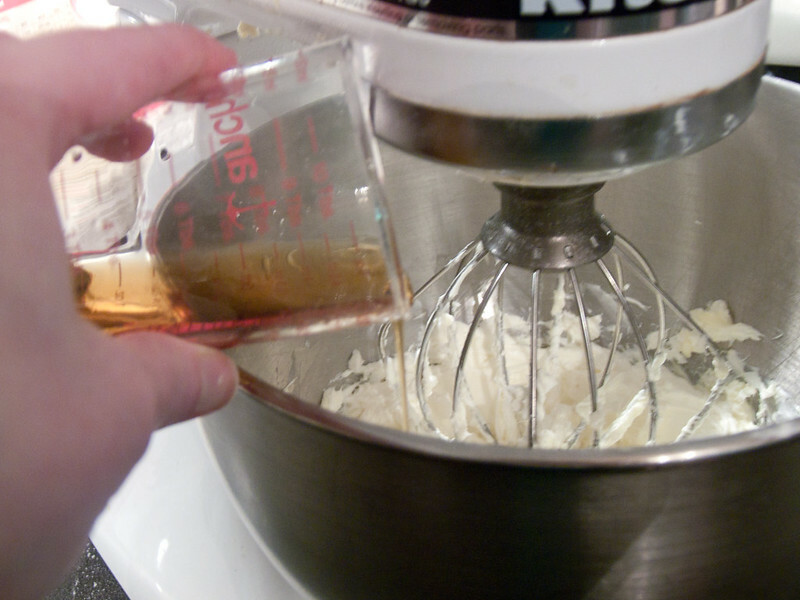 I think it would probably also work if you used heavy cream instead of butter here. 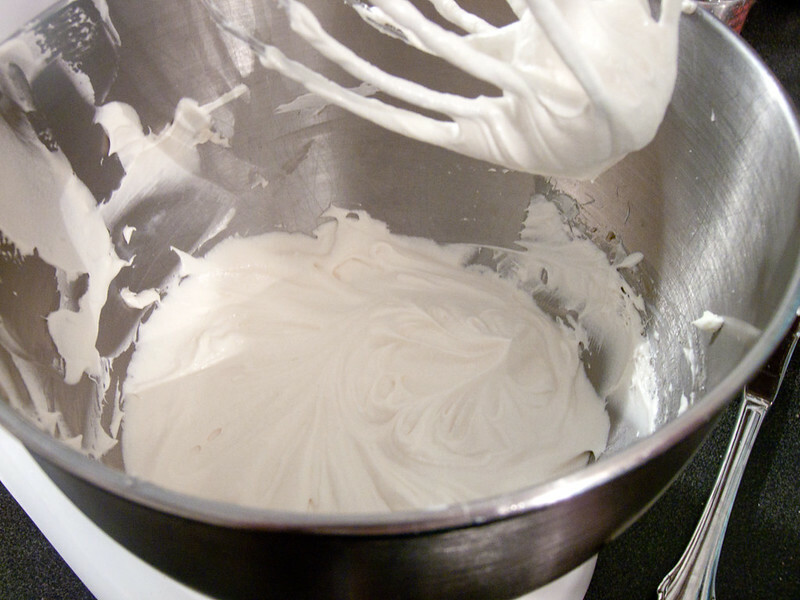 Then you’d have a whipped cream-cream cheese frosting. You can be an overachiever like me and pipe little carrots on them. Totally optional. I just used some leftover frosting, colored with food coloring, and piped out of a ziplock bag with the corner snipped off. These are really good. I can’t even describe how good this frosting is. I prefer it over the kind sweetened with powdered sugar any day. My main complaint with powdered sugar is how it gets so tooth-numbingly sweet so fast. This is sweet, but in a smooth way that doesn’t interfere with the cream cheese flavor. And the cupcakes are sweet without being too sweet. Plus, the sugar in dates is much better for you than refined sugar. Bonus! Note: These are definitely best eaten fresh. Once frosted, they should be refrigerated, but the flavor & texture suffers when cold. If you don’t plan on eating them all at once, I’d suggest frosting as many as you need at a time, keeping the frosting in the fridge and the cupcakes at room temperature. Eat within a few days. Just a suggestion!